In the northwest of Serbian Bosnia there it is a small community of nearly 400 persons, whose ancestors came from the Italian Trentino 130 years ago: the village is called "Stivor". The Italian emigrants from the Trentino valley of "Valsugana" (devastated by floodings) in 1882 settled all around Bosnia and Herzegovina: around Tuzla, Konjic, Banja Luka and Prnjavor. Nearby the town of Prnjavor they created a settlement called "Štivor'. Its founders travelled for months on foot and brought with them their customs, language and beliefs that have remained almost the same so far. The Italians in other parts of Bosnia and Herzegovina mostly returned to their fatherland before the outbreak of World War I. But the population of Stivor was much more attached to this new land and only at recent times they have started emigrating to Italy in huge amounts. However as late as 1921 the number of the Italians living in the area was 292. After the end of World War II farming remained the predominant economic activity in the area, but some Italians of Stivor moved to Italy and Europe. When Tito’s Yugoslavia ended in 1991 and the war in Bosnia broke out, Stivor had 700 inhabitants but most of the Stivorians escaped abroad and many of them reached the Trentino region, their ancestral home. Since then around 530 Stivorians have re-settled in Trentino, and on March 9, 1997 the ”Circolo Trentini di Stivor” (or “Stivorian-Trentinis’ Club”) was founded in Roncegno near Trento. Today there is a local "Trentino Association" that keeps in touch with their home country. The aims of this Bosnian Association are the preservation of Trentino culture and tradition in Stivor (a very small city where 92% of the inhabitants are descendants of the first Italian settlers). On the actual cemetery can be found typical italian names from the Valsugana in Trentino: Andreatta, Agostini, Dalsasso, Postal, Moretti, Bocher, Osti, Fusinato, Montibeller, Dalprà, Paternoster, Valandro. The population of Stivor still uses a special Trentino dialect from the region of Valsugana, which is slowly dying out in Italy. Almost all the inhabitants of Stivor are Italian, the grandchildren and great- grandchildren of a small group – about five hundred in all – of Trentino natives who left the Valsugana valley, then a part of Austria, in 1882 after it had been devastated by a flood on the Brenta river and poverty. Drawn by a massive manpower recruitment campaign, they should have all ended up in Brazil; instead, they entrusted their money and hopes to a middleman who abandoned them at the port of Trieste with neither tickets nor prospects – just after Austria-Hungary had signed the Treaty of Berlin allowing it to administer a still-Turkish Bosnia and started “selecting” settlers to create a Catholic outpost on the ridge between the Austro-Hungarian empire and Ottoman territory. The only formality involved was a request on stamped paper. It was time to leave for the Balkans: a month and a half’s walk pulling creaking carts piled high with equipment and seeds along rutted mule tracks until they came to a stop in a sea of green nothingness. They cut down trees, tilled the land and built shacks. Thus Stivor came into existence. There were other peasants – Polish, Czech, Ukrainian – not far away, their story also one of forced emigration. The Trentino natives have never moved since; however, instead of being absorbed by the trend towards standardization of usages and customs, they have maintained their ties with their country of origin. 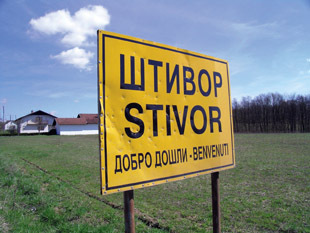 As recently as World War II, Stivor was a sealed-off community; weddings and baptisms were private affairs and not even subsequent intermarriages with Bosnian Serbs in the area have managed to affect their identity, so much so that nearly all the inhabitants are now partially related to each other. There are a handful of surnames, always the same ones: Agostini, Andreata, Moreti, Montibeler, Postaj, Dalsaso, Bocher, Paternoster. Some have dropped the double letters from their names or incorporated hitherto unknown consonants to adapt to the local phonetic structure: a visit to the small cemetery makes it possible to date the stages of this concession to integration. The first immigrant tomb, however, is located just outside the village with no surrounding wall; it lies in the shade of three century-old linden trees, crystallized in an almost unreal silence, wrapped in eternal peace since 1883. Giuseppe Moreti, a cordial 50-year-old man with a cool gaze, is the community’s spokesman and the president of the local branch of the Trentini nel mondo association of Trentino nationals abroad. “There are two hundred of us”, he specifies immediately. “In 1998 the Italian government recognised our right to also have Italian citizenship and our passports were sent to us, but Italian has always been the mother tongue here anyway, even at school. Unfortunately there are few young people today, because when the war broke out in 1992, many of our youngsters ran away to Italy to look for work. The village remained without electricity or telephones for two years. Those who stayed on had to make the best of it”. As he speaks, he glances at the fields that start outside his window. There is not a single cottage, house or shed in Stivor without at least one hectare of cultivated land: vegetable gardens, vineyards and orchards. Each family also has a cistern to collect rainwater for household use and draws drinking water from wells. The Autonomous Province of Trento in Italy has dipped into regional funds to solve Stivor’s water supply problem. In collaboration with local administrations, it has already built two huge tanks and three big wells and invested 500,000 euros in the construction of an aqueduct which is expected to be functional in five years’ time. “Some have come back”, Giuseppe continues as a boy on the road waves heartily to him in greeting. “Others commute to and from Valsugana, where they are employed as specialised workers in large construction companies. A worker earns 400 convertible marks a month here, or about 200 euros, so it is understandable that many of them prefer to remain in Trentino. So some people come to visit their families every weekend while others only come here for the holidays”. All year round, mainly in summer, cars keep coming and going between northern Bosnia and places like Strigno, Borgo and Roncegno in Trentino. Whole wedding processions often leave from Trentino, complete with traditional bands bringing up the parade, to come and get married in the little village church and celebrate with a wedding lunch of polenta and luganega sausages in the club hall. It’s not just a question of roots: a reception for two hundred people, i.e. the entire village, only costs about 2,000 euros. Financial considerations aside, the call of the land and relatives is undying even for those who have crossed over to another world. Stefano Montibeler, a sturdy 67-year-old, greets everyone he meets with the good cheer and enthusiasm of the village’s most unexpected guest. This is the eighth time in the past forty years that he is back visiting his native land. The embroidered kangaroo logo on his polo shirt and his caricatural accent reveal his story of a political refugee outside the bounds of Europe. Having fled Tito’s regime in 1965, just married and with “nary a dinar in my pockets”, he stopped off in Trieste and on the outskirts of Latina, where he and his wife decided to get on the first ship to Australia, an alternative to America for fortune seekers of the time. A month’s journey at sea, passing through the Suez Canal; the difficult process of adaptation, the apprenticeships at thousands of different jobs: a story shared by millions of Italian emigrants between the late nineteenth and early twentieth centuries and today’s Third World emigrants, who have simply reversed the direction of the migratory flow. Montibeler now lives in Canberra, where he is a building contractor: a successful one, not least because “the Australians have never really been all that keen on back-breaking work”. He has only heard about the war in other people’s stories, unlike Ivan Osti, 36, who has a passion for Belgrade’s Red Star football club and exhibits a rare courteousness. Osti experienced the war from up close. He tells of the foolhardiness and determination of his frequent trips from Bosnia to Italy in the three-year period from 1992 to 1995: “Stivor was spared, because they knew we were Italian, but in Derventa, a village only fifteen kilometres away as the crow flies, the bombers razed everything to the ground. They would pass close overhead, flying so low that our caps would fly off our heads”. He had to pay the municipality a tax of 150 German marks a month to be able to leave Stivor, money that was meant to finance war logistics but “ended up making a couple of people richer”. Every trip was an odyssey. In the beginning he would travel via Slovenia and Croatia but the gun battles and army roadblocks became increasingly frequent and dangerous, as he risked being killed because of a misunderstanding. The alternative was to skirt the Balkans via Austria and Hungary, entering Bosnia through Serbia. Today, Ivan hopes that someone will finally decide to invest in this land and that young Stivorians can come back, drawn by new jobs. Some have even started thinking of hunting-related tourism, advertising empty houses on the Internet and renting them to Italian hunters in search of virgin and, above all – a rarity for Bosnia – mine-free woodland. While waiting for Stivorians to rebuild the future, it is up to the elderly to maintain the link with their ancestors and carry the religion forward in harmony with their Orthodox and Muslim neighbours. Their homes are shrines to piety and tradition, with religious icons, faded photographs, embroidered lace and the inevitable bottle of slivovitza, homemade plum brandy. Listening to Giuseppe’s loquacious 80- year-old mother Elena, 83-year-old Antonia or 91-year-old Arcangelo takes you on a journey into time, for their throats emit a dialect that has remained unchanged since the 19th century, a small treasure for ethnolinguists. In the jigsaw puzzle of ethnic groups in Bosnia today, the Italians are the smallest of the minorities and it is hard to even find a trace of them on the official maps. They are certainly not represented in the last census, which dates back to 1991: 44% Bosnian Muslim (Bosniak), 31% Serb, 17% Croat, 6% Yugoslav (people nostalgic for the Federal Socialist Republic and mixed marriages). Since then there have only been estimates. The ethnic cleansing and the war refugees have shuffled the cards. Going by the figures in the 2006 CIA World Factbook, there does not seem to have been a radical change: 48% Bosnian Muslim, 37.1% Serb, 14.3% Croat and a tiny but heterogeneous 0.6% “Other” which also includes the Stivor Italians. Reviewing the data from a geographical standpoint, however, the country has changed its description: BIRN (Balkan Investigative Reporting Network), the regional journalistic organisation, estimates that in the Republic of Srpska, where the majority of the population was formerly Bosnian Muslim, over 90% of the current population comprises people of Serb origin. It is here, far from political games and racial hatred, that the tale of Stivor’s Trentino natives continues to be told. The small Bosnian cemetery marks the stages of the Trentino nationals’ integration. The first immigrant tomb, however, is located just outside the village, in the shade of three century-old linden trees. In the jigsaw puzzle of ethnic groups in Bosnia today, the Italians are the smal- lest of the minorities and it is up to the elderly to maintain the link with their ancestors and carry the religion forward in harmony with their Orthodox and Muslim neighbours. Young people who witnessed the war from up close, hope that someone will decide to invest in this land. Did you know that you can shorten your long urls with AdFly and earn cash from every visit to your shortened links.